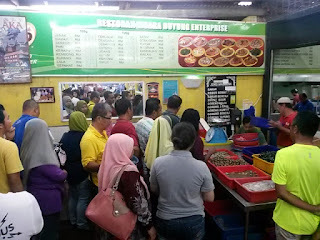 The Queue gets shorter and I can almost SEE the seafood! Sometimes, birdwatching can be done just looking out of a hotel room window. Armed with my Minox binoculars 10 x 42, my room was on the Second Floor of World Youth Hotel, at eye-level with huge Tree. Shade for my car. 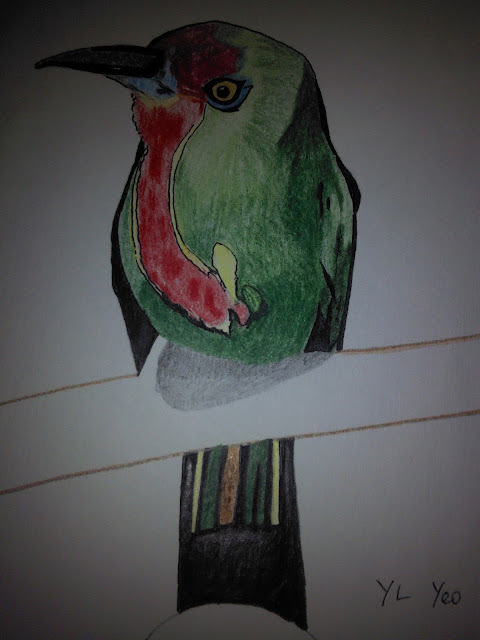 Spent 35 minutes admiring the birds and a raptor. Brown Shrike perched on top of the Tree for a few minutes. A pair of Scarlet-Backed Flowerpecker flitted about near it. I only saw the flame-like redness on the back of this flowerpecker for a few seconds before both flew off to a nearby Quinine Tree. Brahminy Kite soared above the Tree on that hot Sunday evening. Pink-necked Pigeon was the last bird I saw perched quietly at the Treetop. 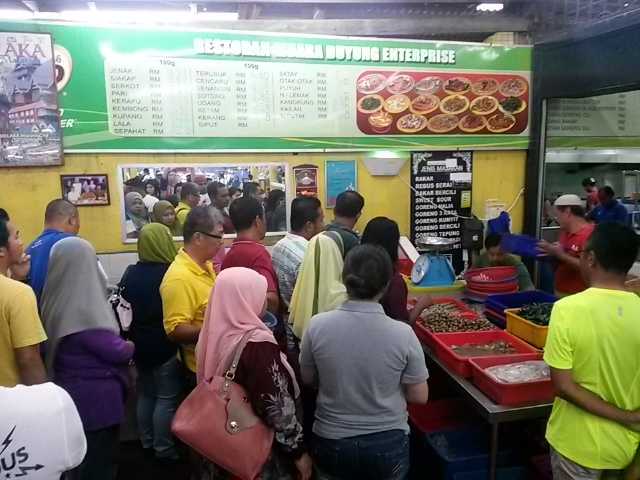 Left by 6.20pm as Waze estimated it will take half an hour to reach Muara Sungai Duyong, famous for its seafood and nasi lemak specialties. Was there many years ago with my friend from PIKOM, Ong Kian Yew and office colleague, Fara. I had to literally pick up my Ikan Kembong (Mackerel) with my hand and plonk it into a basket that a kind lady customer had passed to me when she saw that I was "basket-less". I had to dip my hand into one of the buckets containing the squids (for the record - these were not live squids), and luckily when it came to the bamboo clams, the pakcik helped me to scoop those clams onto the weighing scale to verify my 300 grams. 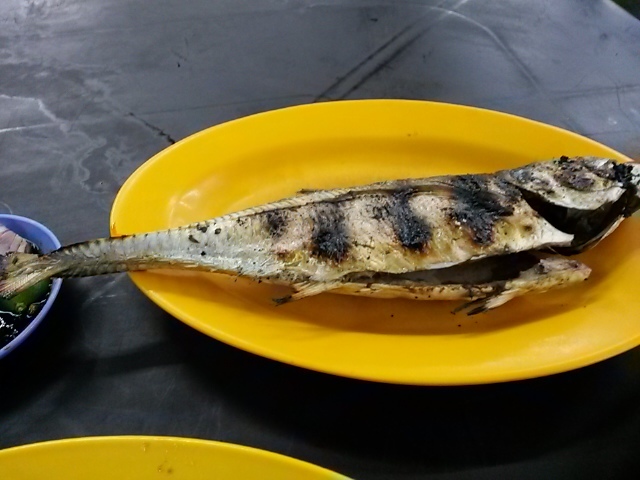 Watermelon juice and a packet of nasi lemak arrived earlier than my Ikan Bakar (Grilled Fish ie the Mackerel), Deep-fried Squid and Bamboo Clams which were stir-fried with Chilli, Ginger and Onions. It was literally dark when all my dishes arrived. 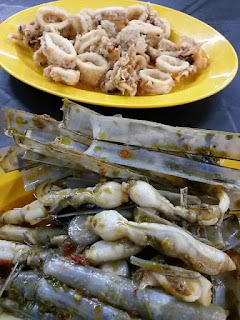 My seafood dinner bill came to RM32.50. Worth every cent and the wait since Patience is a Virtue:) Ayer Keroh Botanical Park, according to my Waze was 5-minutes drive from World Youth Hotel. Couldn't make it this time as I had to make my way to Multimedia University Malacca campus for work-related event. 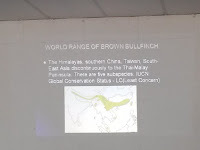 Mr Allen J updated members of the Wild Bird Club Malaysia about the status of Brown Bullfinch in Fraser Hill, on a very cool and misty Sunday. 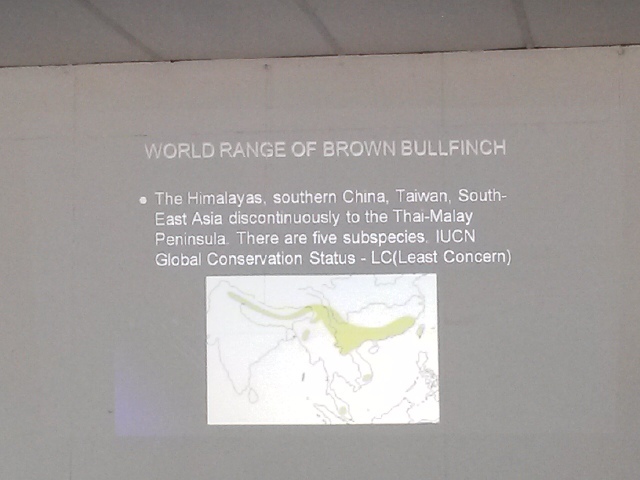 Brown Bullfinch has not been seen for many years since 1992. 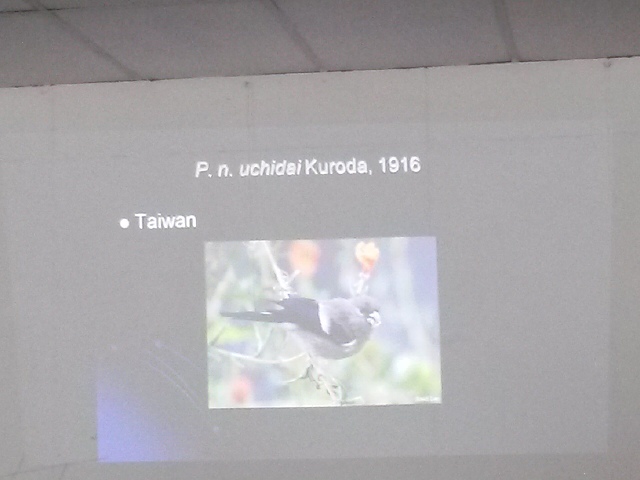 He gave us a worldwide preview of this species including the various bullfinches found in Asia and Southeast Asia region. 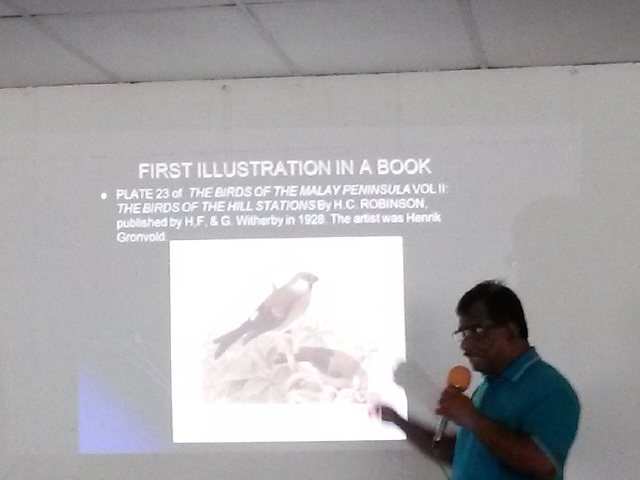 He pinpointed the difference between Brown Bullfinch male and female species from the beautiful illustration in the "Birds of Malay Peninsular" by Robinson and Chasen. I had blogged about this book earlier which had this illustration of the Bullfinch. 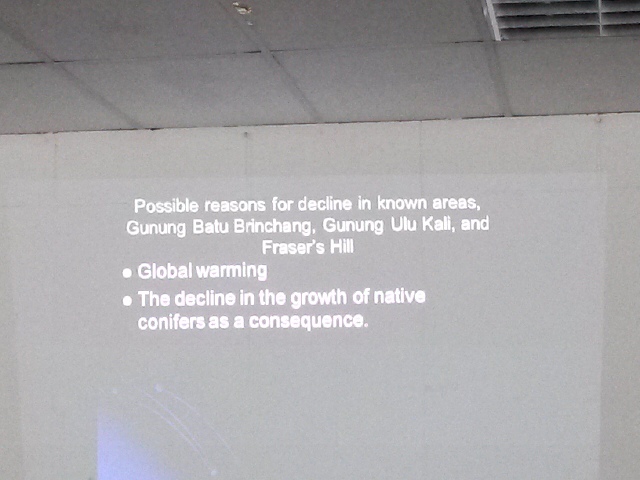 Possible reasons for the decline of Brown Bullfinch in Fraser Hill and other montane highlands within Malaysia were highlighted by Allen in his final slide. 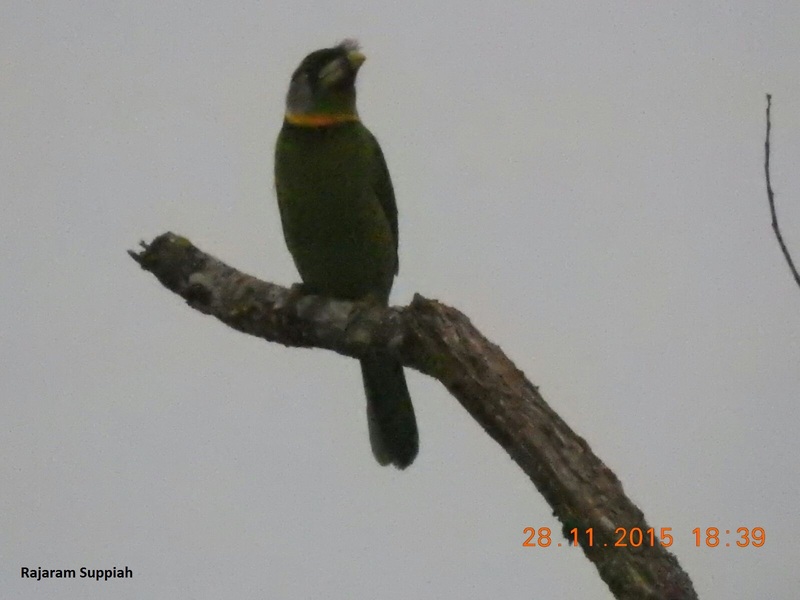 Flock of Long-Tailed Broadbills appeared and flew across us along New Gap Road. Eight to ten broad bills. 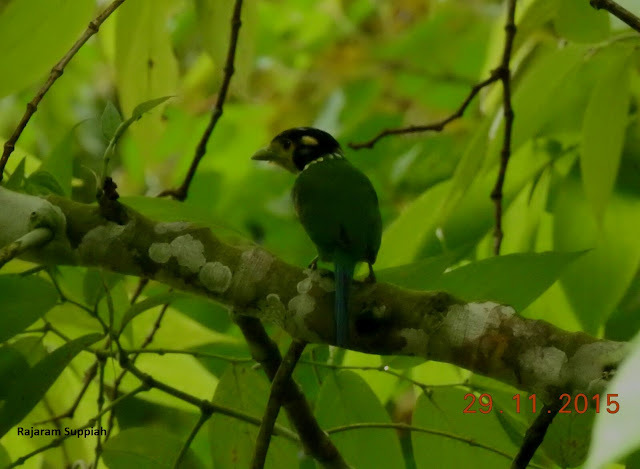 One by one, the broadbill flew further up into the trees after we have had a good few minutes observing it. 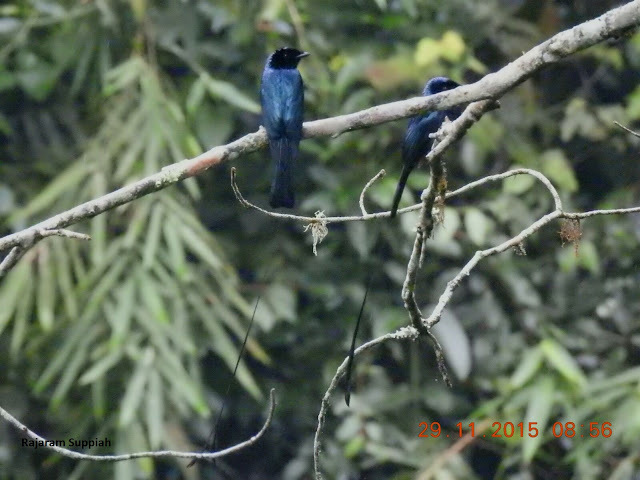 Luckily Raj and Ang were able to get a few pictures before these broad bills disappeared into the forest. Funny looking bird with its very parrot-like head, bulky green body and long tail (hence its first name) with bluish tinge in the middle. 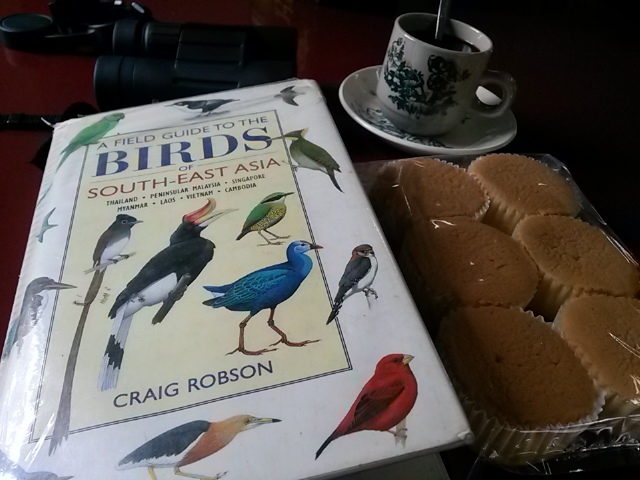 Broad bills were wishing us safe journey back home on Day 2, our last day of birdwatching in Fraser Hill. Friendship was also forged with fellow birders from Malaysia including friends from Singapore and India. 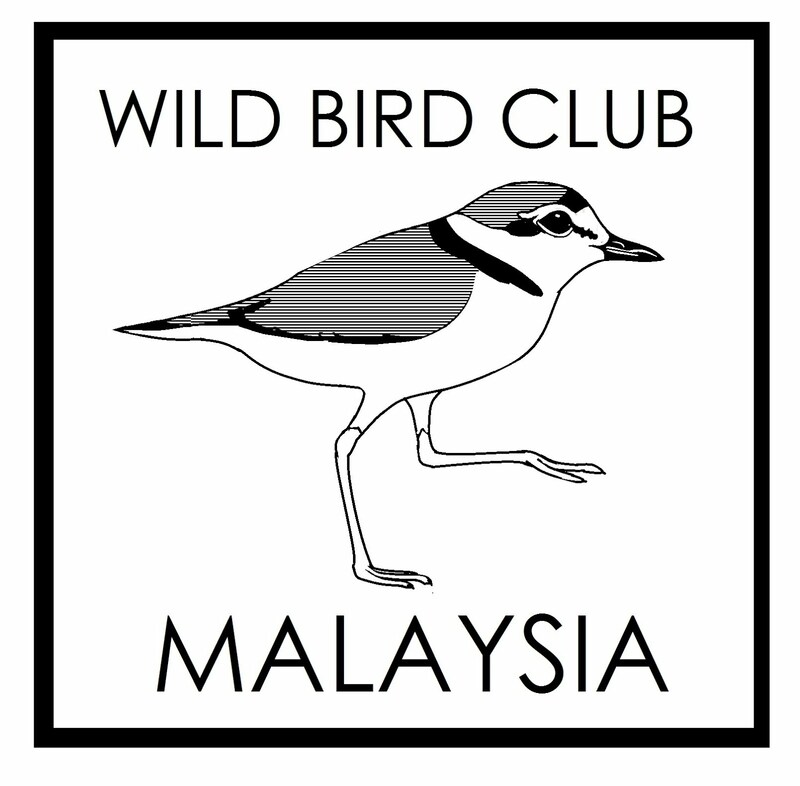 Attended inaugural Wild Bird Club Malaysia Annual General Meeting on 28th November, Saturday. 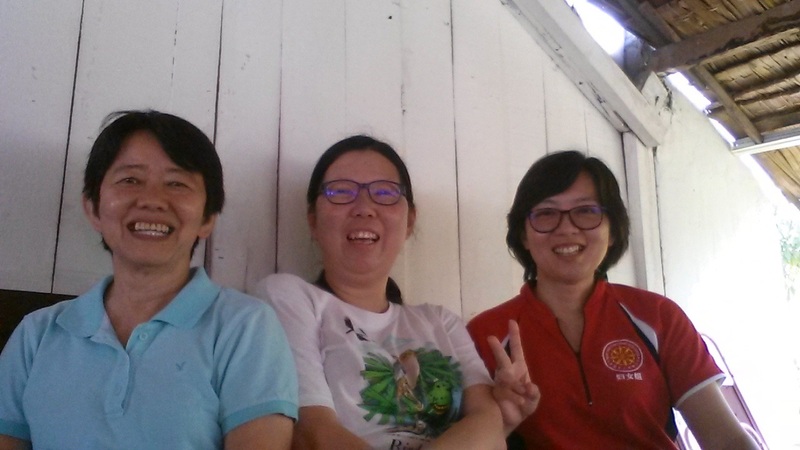 Parked my car at Kuala Kubu Bahru, and met up with Raj and Ang there. Hopped on Ang's Isuzu Four-Wheel (thanks Ang!) 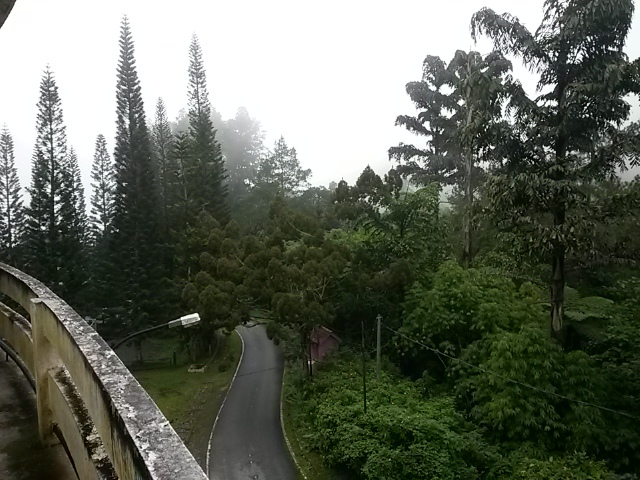 and off we went on an adventure in Fraser Hill. 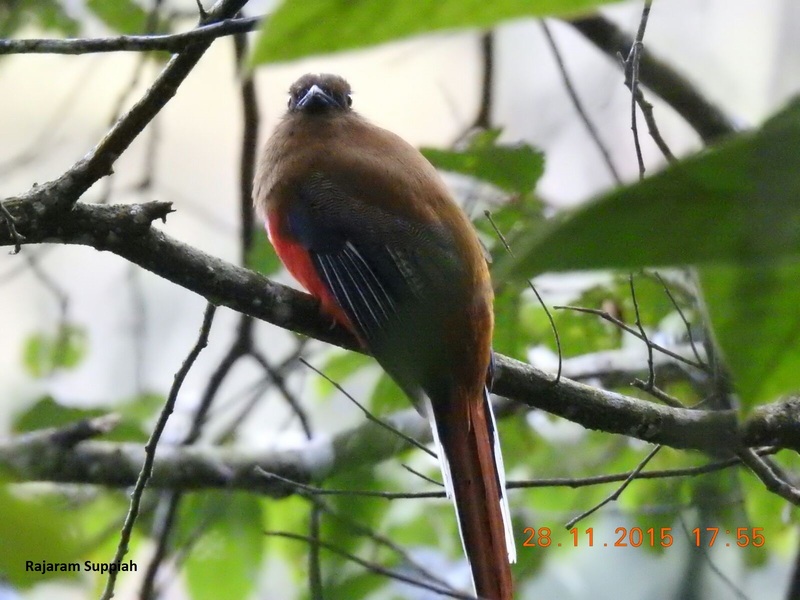 Red-headed trogon, male and female were sighted in Hemmants Trail. 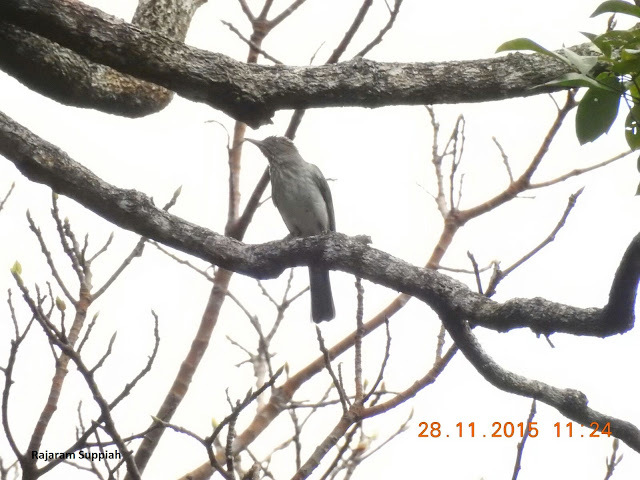 Streaked Bulbul seen along 8km long old Gap Road. Alfresco lunch at picnic hut on the way to Pine Resort with home-made curry chicken from Malacca (thanks Raj!). identified this flock as Purple-Backed Starling during the information-sharing session that Saturday night at Pine Resort. Estimated to be 100+ starlings and this flock was also seen at the new Gap Road. 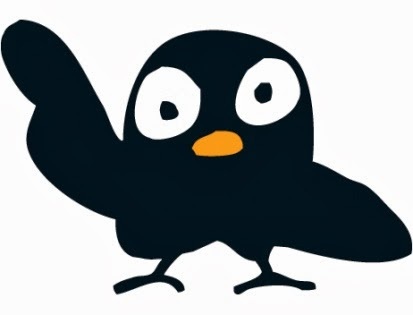 Started birdwatching in Fraser Hill since 1998. Always feel like my second home. 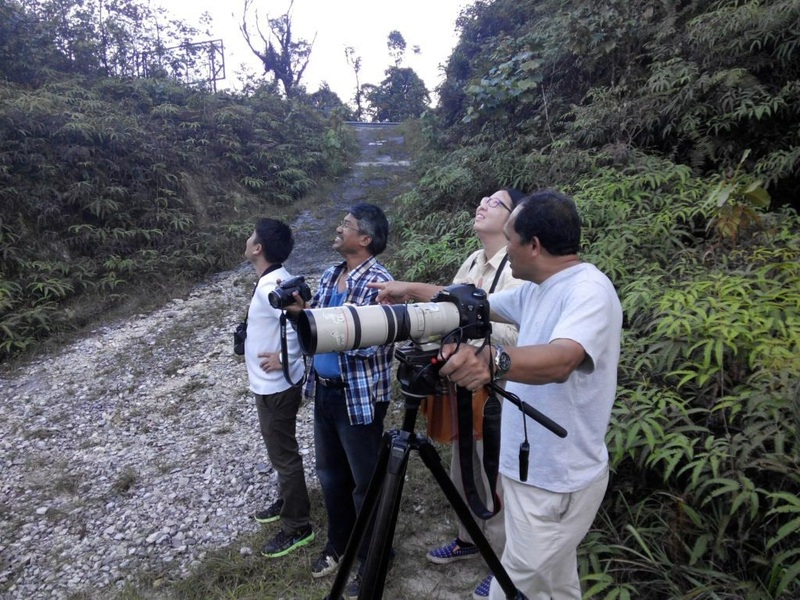 Mountain Scops Owl heard along Old Telekom Loop on Saturday, 28th November 2015. Finally after 17 years of birdwatching in Fraser Hill, I saw this owl for a few minutes before it flew off into the dark of the night. Reached Pine Resort slightly after midnight. Tired but thankful that I got to see the Owl. 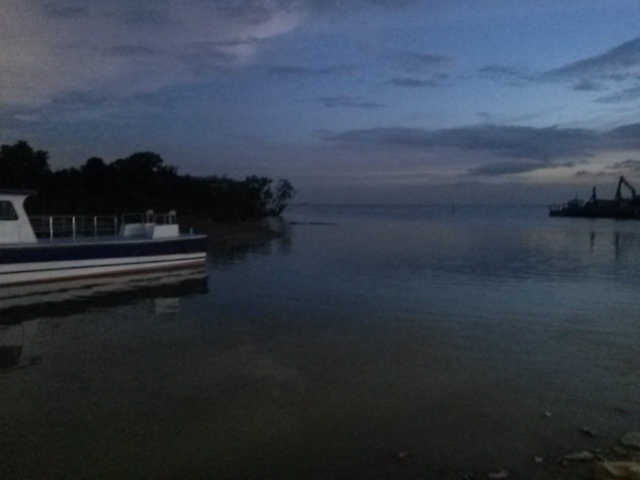 Merlimau jetty. 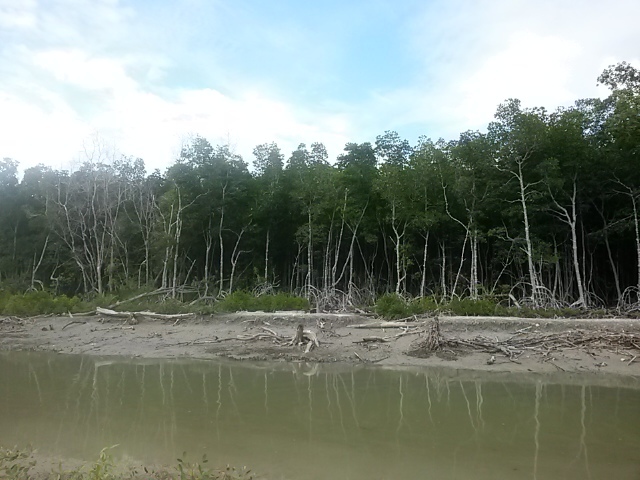 Small patch of mangrove forest. Spotted solitary common sandpiper walking on mudflats. Heard collared kingfisher & saw it fly off from edge of mangrove into the trees. 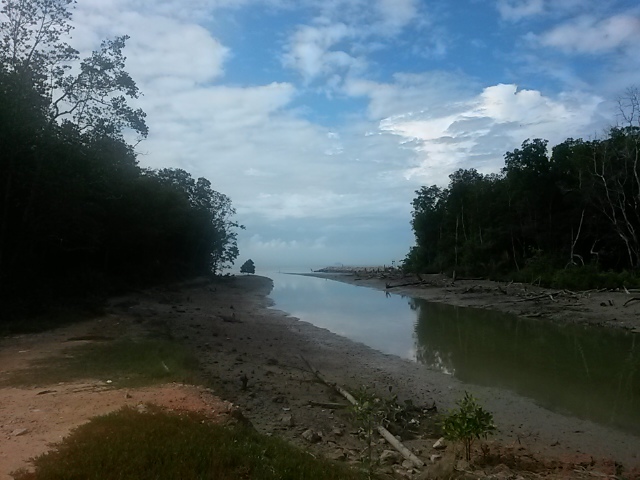 Was at Sungai Rambai Pond area earlier in the morning. It was already getting hot & sun was so glaring on the way to the Pond by 7.30am. Lesser Whistling Ducks were no longer at the pond area. Black Kites were out and about when we arrived at the pond. A Black-shouldered Kite circled near the pond before flying back towards oil palm plantation. Big flock of Black-backed (Purple) Swamphen were busy feeding within the pond. Chicks and Juvenile swamphen were seen too with latter in all-black plumage. 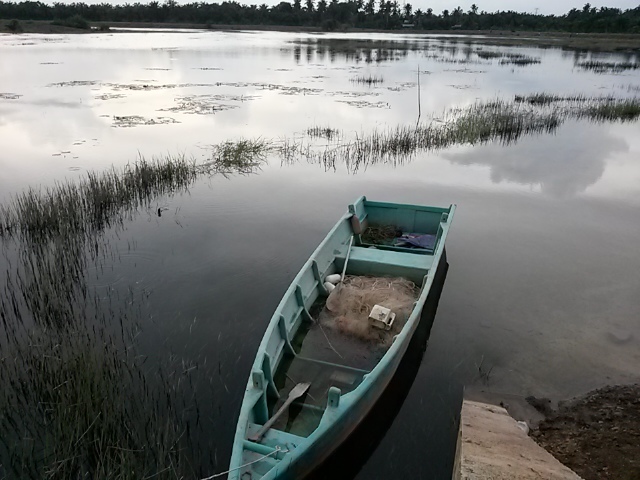 Left pond by 9.30am as it was very hot by then and headed for Merlimau. Fong Lin in photographic action at Merlimau ricefields. The Grey-Headed Lapwing was too far off for her to take a good picture of it. This Lapwing species was larger than the twenty (20) plus Red-Wattled Lapwings that were. 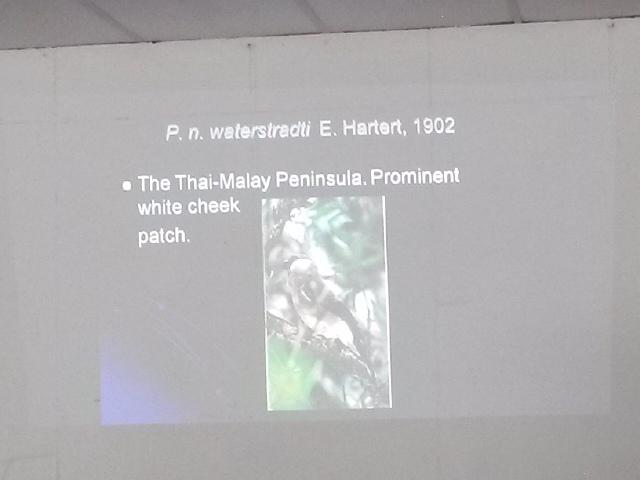 Its Greyish duck-like head and black breastband were very visible. 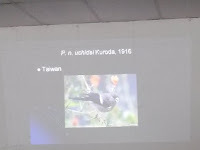 Grey-headed breeds in northeast China & Japan and mainland population is reported to be wintering in northern Southeast Asia, according to Wikipedia. 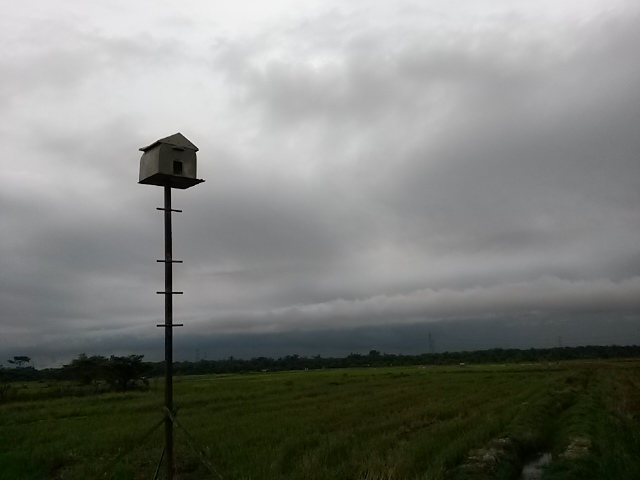 To see this lone Grey-headed Lapwing in Merlimau ricefields was a big surprise for me. 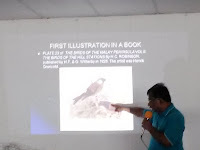 I checked with my birding guru from Malacca & Negeri Sembilan, Ang Teck Hin and he said it was possible as he had seen it before in the paddyfields of Sungai Balang, Muar. 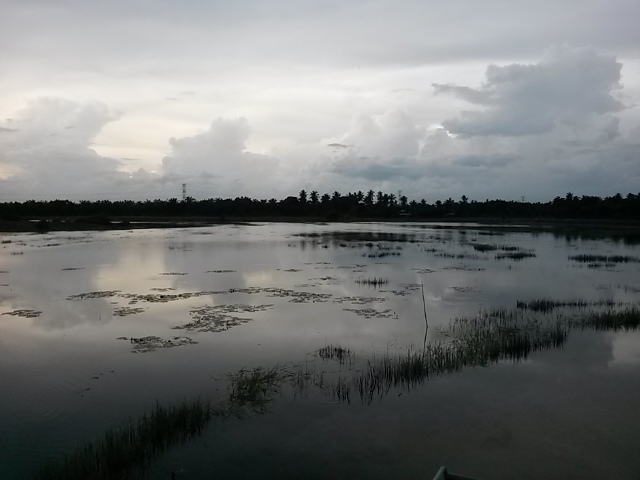 The paddyfields were filled with 20+ Red-Wattled Lapwings, calling out to each other with the solitary Grey-Headed Lapwing amongst them. Bigger flock of egrets were in a nearby patch that was being ploughed by a paddyfield tractor. The egrets followed the tractor with such zeal, eagerly waiting for the "food" that would be churned up by all that ploughing action. 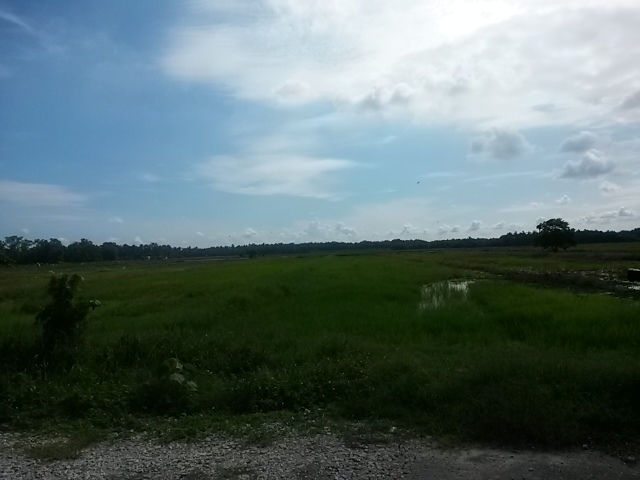 Getting too hot by 11am, so Fong Lin and I left Merlimau Ricefields by then. 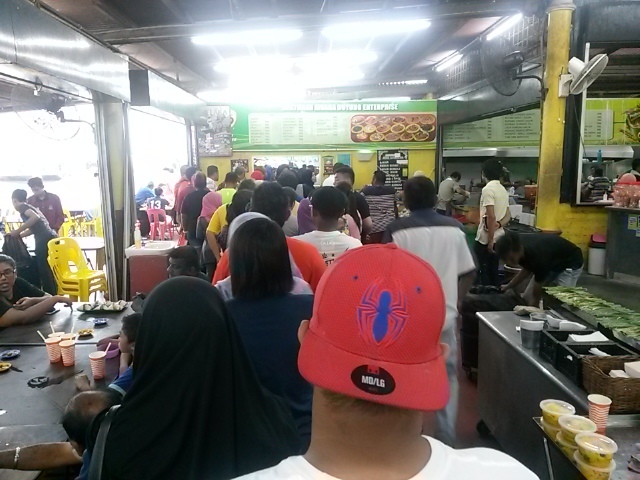 We reached Muar by 11.45am after making a quick stop to buy some coconut water at one of the roadside stalls. 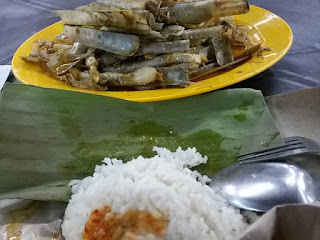 We met up with Fanny, a Muarian herself who drove us to Parit Jawa which is well-known for Asam Fish dish. The restaurant at Parit Jawa was closed so we headed to Chun Hui Restaurant instead which was packed. 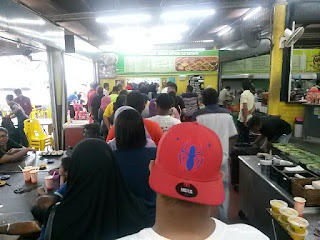 We had to wait for over one hour for our dishes (including the Asam Fish Curry) and were too hungry to take a picture of the dishes. We finished the Curry, Fried fish, Beansprout and Steamed Otak in less than 20 minutes. 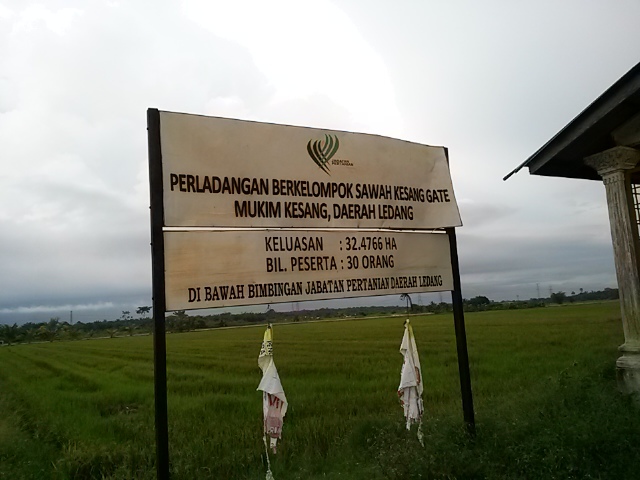 Saw some paddyfields in Kesang, Ledang District which is under the care of Agricultural Department of Ledang District. 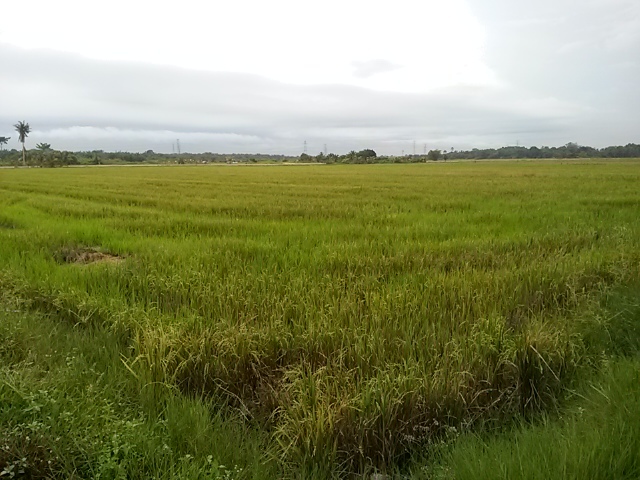 Paddyfields were yellowing but in terms of birdlife, it was very quiet. 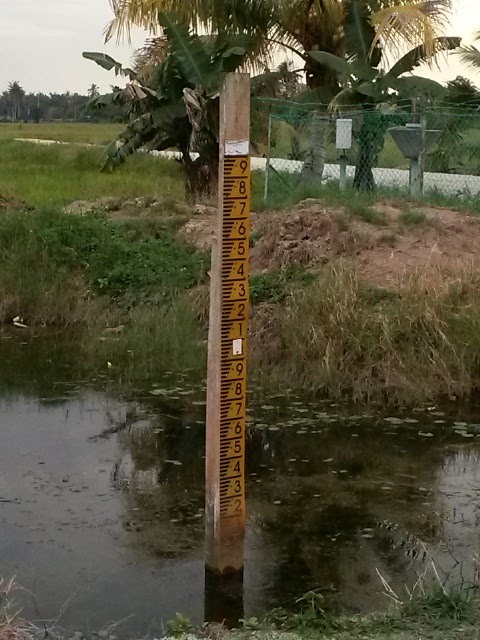 Measurement tool to monitor water level in one of the canals below. 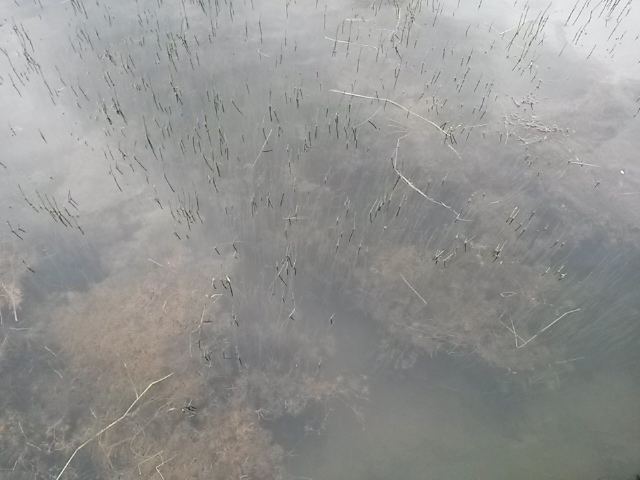 Looked to be at a very low level compared to the measurement tool in the pond at Sungai Rambai. Owl house set up for the farmer's best bird buddy the Barn Owl, I suppose. Didn't see any owls flying home to rest that Saturday evening & I waited until 6.30pm. 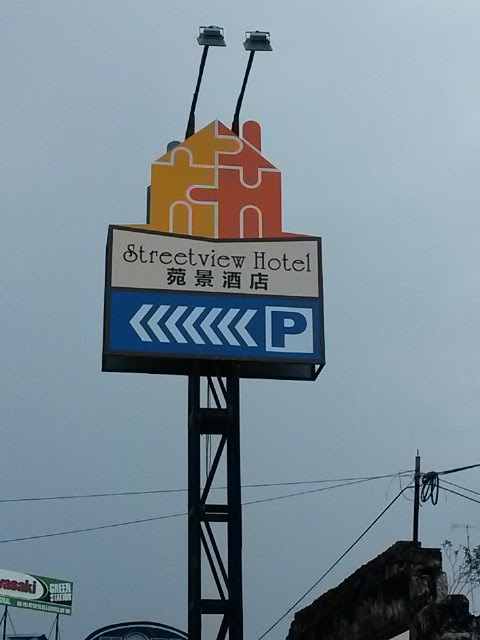 It was getting late and unlike the owl, I had to check-in to Streetview Hotel since it will take another 15 minute drive from paddyfields to Muar, according to Waze. 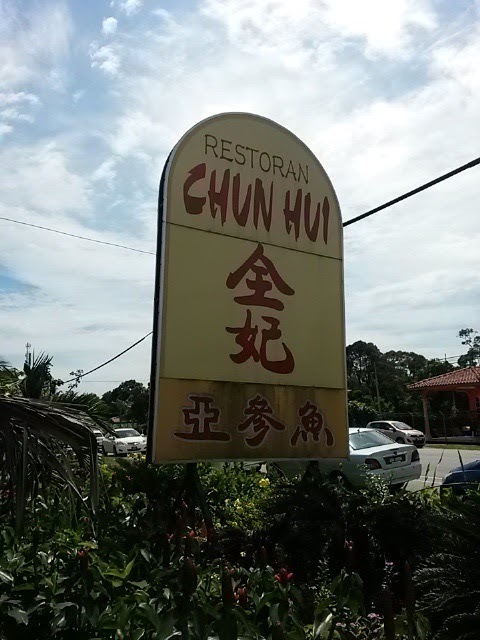 Lucky there's this sign to the Hotel in Muar. It was getting dark when I arrived in Muar so signboards such as this are a welcome sight after spending earlier hours exploring the birdwatching sites around Sungai Rambai and Ledang District. 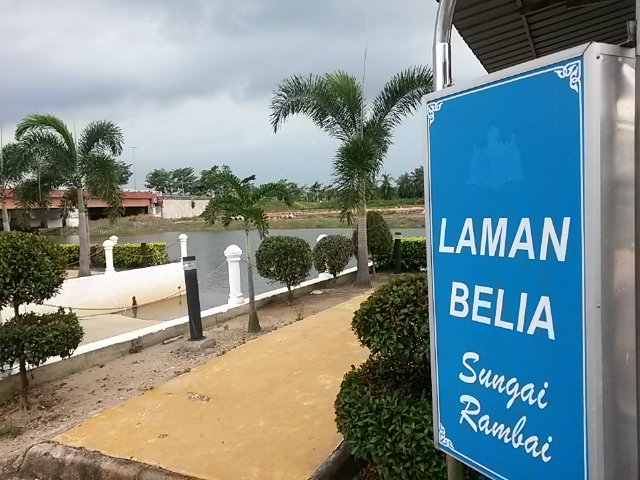 Sungai Rambai is the gateway to Malacca from Johor. 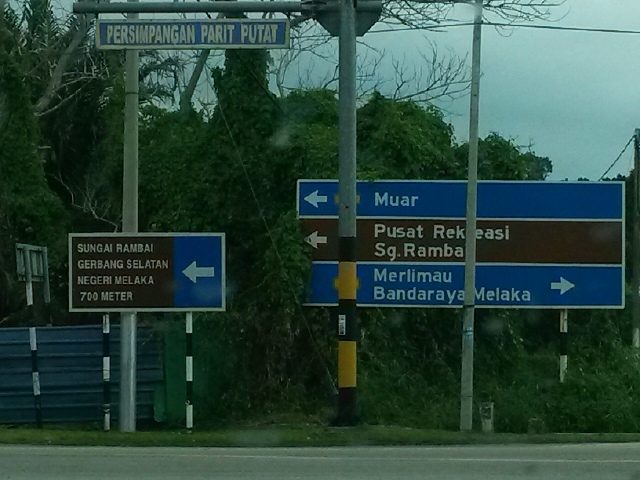 Finally found my way there from Lebuhraya AMJ after exiting Merlimau/Jasin from Plus Highway. 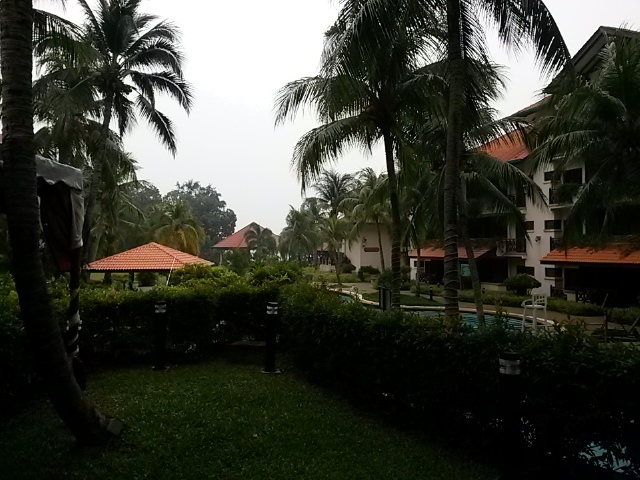 About two & half hour drive from KL. Slope for small boats & kayaks to enter Sungai Kesang. 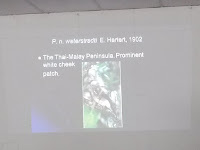 The name of the town is Sungai Rambai but the river is differently named. This was a river with clear water and I could actually see some parts of the riverbed, with river grasses, algae and all. 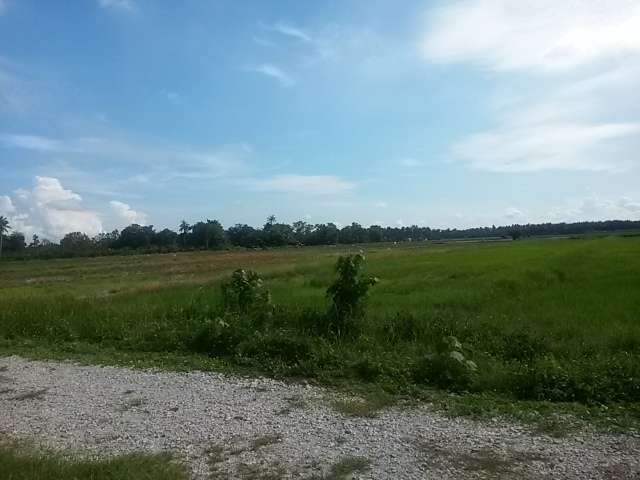 Part of the recreational park in Sungai Rambai. The park was not that crowded despite it being a Saturday. Grasses & other plants forming the riverbed. 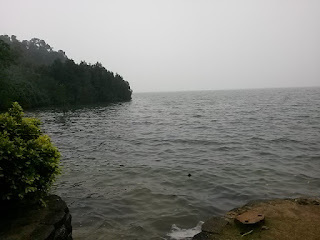 I marveled at the sight of this river, since (sadly) it is not a daily scene in the city. 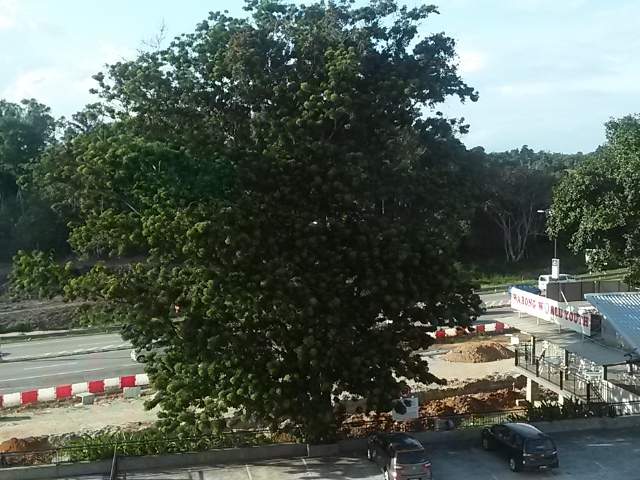 Large pond awaits alongside a trunk road I took, nearby Sungai Rambai Recreational Park. 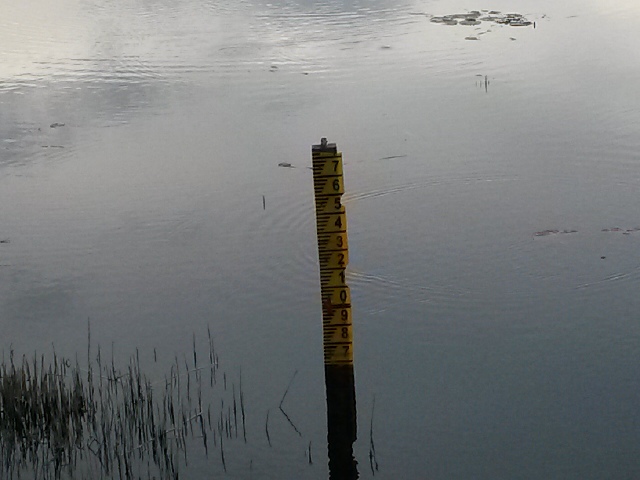 Measurement tool to monitor the annual floods, I suppose. Quite a few people were fishing along the edges of this pond. Small flock of Lesser Whistling Ducks joined the larger flock of Purple Swamphens in this pond on that Saturday, 22nd November 2015 evening. Also sighted were the Common Sandpiper, Purple Heron, Grey Heron and Egrets. Watergate at the edge of the pond which regulates the flow of water from surrounding canals. Hardly any trees growing along the edges of the pond. Left the pond at around 6pm. Planned to continue birdwatching early Sunday morning with my friend Fong Lin who is an avid photographer. We had just taken a short lunch break at around 1pm and continued exploring the forest that surrounded this old road. 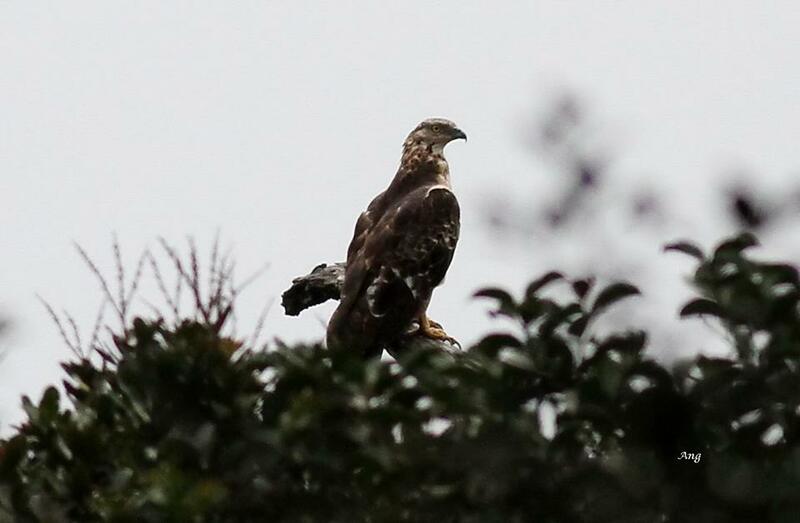 Pleasant surprise to see this Honey Buzzard at the top of Genting Highlands. Seen soaring along the forest canopy alongside this old road earlier before it was spotted flying closer to us before it perched on the tree, when we were walking back to Ang's four-wheel. 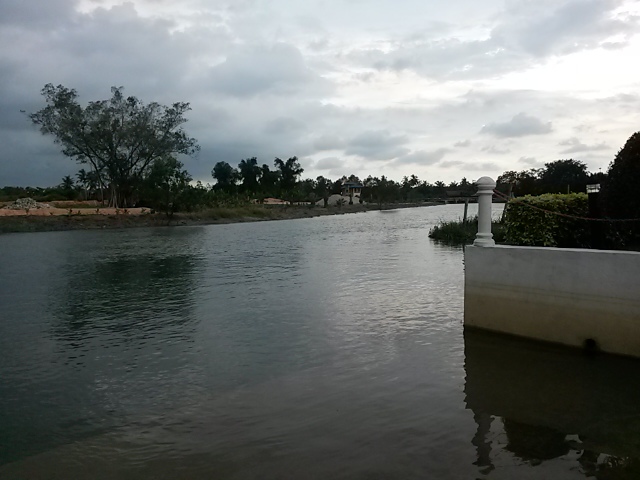 It was just around 3pm on a hot and sunny Saturday afternoon, end-October 2015. Having lunch of fried rice with homemade chicken curry (brought all the way from Malacca by Raj) at 1,000m above sea level, amidst cool mountain breeze, was simply unforgettable. 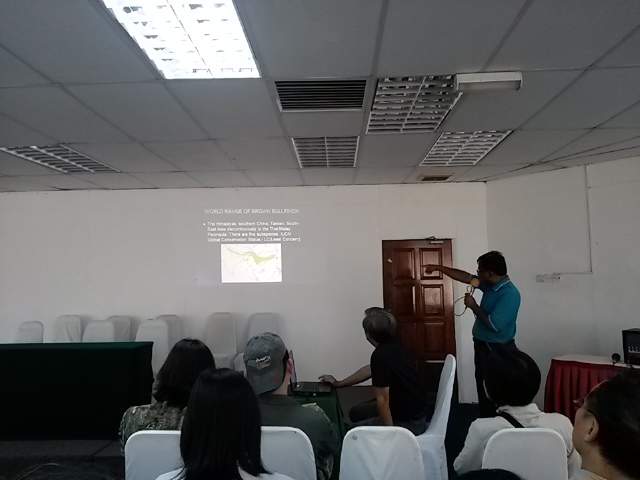 Birdwatchers from Malacca and Negeri Sembilan, CT Chan, Raj, Vuthy and myself, and lead by Ang Teck Hin, our birding guru. Realized I was sunburnt the next day but I didn't mind. 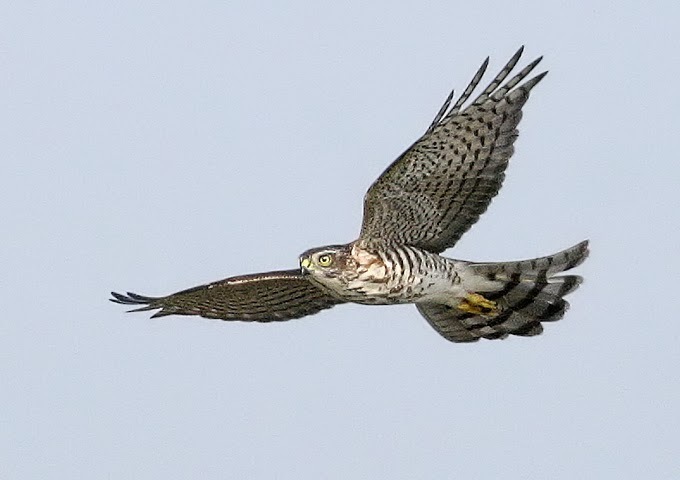 All in, 33 species of montane & sub-montane birds were seen on that Saturday morning from 9am to 6pm. 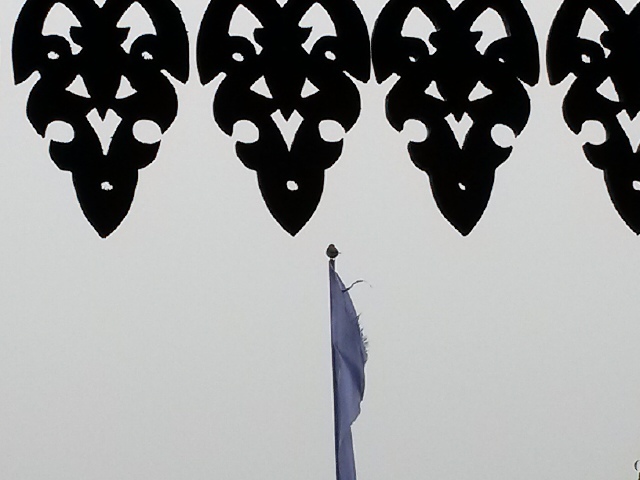 Seeing all these birds and the clear blue skies in Genting Highlands made every second of the outing memorable. 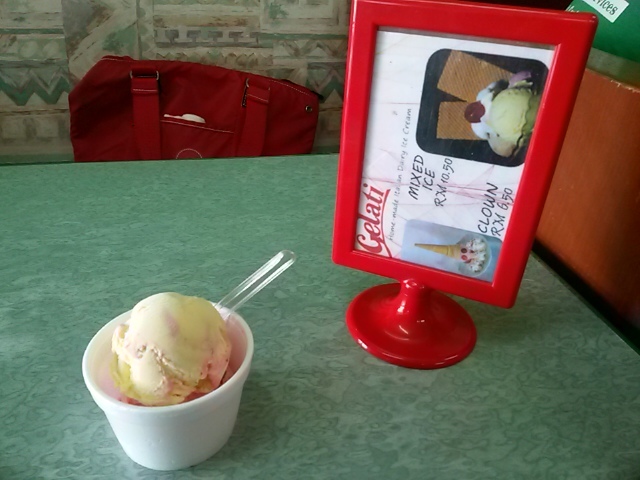 Italian ice-cream is still available at Tino's Pizza! High tide on Sunday evening so was unable to walk right up to the edge of the mangroves in Tanjung Tuan. Windy Sunday morning at Ilham Resort. The greenery of the Resort which greeted us when we went for our breakfast, was a very welcome sight for sore eyes. 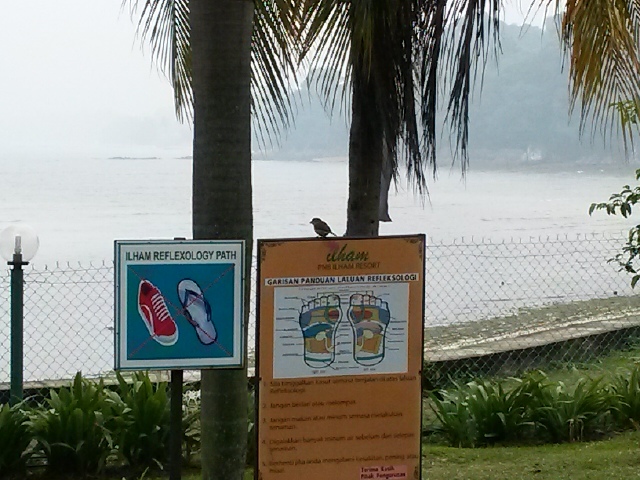 A migratory shrike flew into view and perched on the reflexology signboard at Ilham Resort around 10.30am. This bulky bird then flew off to perch on the flagpost, and looked like it was surveying the beach of Tanjung Tuan for possible prey. 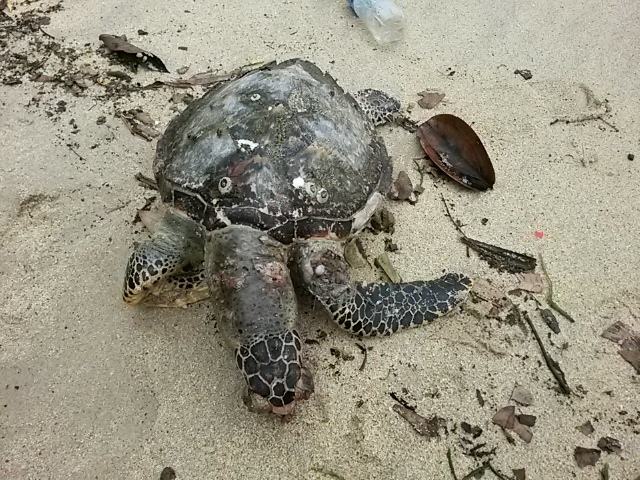 Dead turtle spotted during low tide on late Monday morning. Such a sad sight. Yet in such sadness, there remains hope for the survival of the turtle population in Tanjung Tuan. 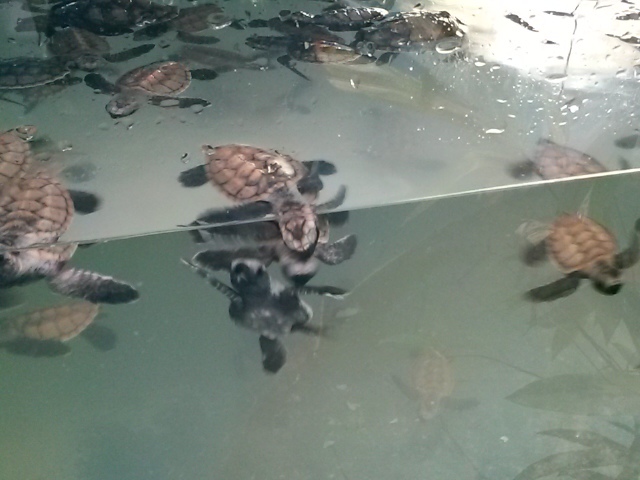 Baby turtles (look like Hawksbill species) are being taken care of in the Hatchery at Glory Beach Resort, Port Dickson.